Legalization of marijuana is not only shifting individual usage patterns, local markets, and medical treatment options–it is also having an impact on the global marijuana industry. While Colorado and Washington have completely legalized recreational use, over half of states have legalized marijuana for medical use. More legal growing operations in the United States means that more Americans are buying “Made in America” pot, and that has severely undercutting growers, profits and cartels in Mexico. According to a recent NPR report, growers in Mexico have seen a significant decline in profits and in the value of their crops. While a kilo of marijuana was worth $60 to $90 a couple years ago, it is now only worth $30 or $40 per kilo. Many growers in Mexico are worried that legalization in the U.S. overtime could put them out of business. Workers on the communal crops are owned by the cartels but are worked by young laborers who are paid around $150 per month. They are provided with the tools for growing and are responsible for all aspects of producing and the packaging of the marijuana. Film, television, and other images of Mexican traffickers may look more like overcompensated cartel operators, but the truth is that many of the workers are just low-wage farmers seeking to support their families. Growing pot and pot farms in Mexico have given many people a livelihood, that could be lost overtime if America legalizes marijuana. It is dangerous work for many of the farmers, as they are threatened by law enforcement and cartel operators. If the armed forces come to investigate, they are forced to run. At some point, low profits for their operations won’t be worth the risk. It isn’t just farmers that have been concerned about legalization in the U.S. According to a report published by the Mexican Institute of Competitiveness in 2012, a slump in the economy was predicted in the event of legalization. 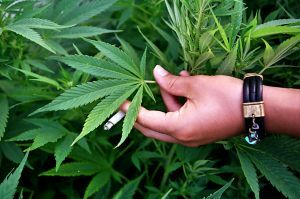 The study was titled, “If Our Neighbors Legalize,” and predicted that the cartels would see profits drop between 22 and 30% in the U.S. At one point, all of the weed being purchased and consumed in the States came from Mexico or further south, but now it is almost all homegrown, from the U.S. or Canada. One of the reasons that Americans prefer domestic grown pot is because of the trade and association with the cartels. U.S. grown pot can be three or four times more expensive, but part of the reason is that it is grown and cultivated in high-tech greenhouses and is often much stronger than its Mexican counterpart. American cannabis typically has 10 to 20 percent THC where the THC in a Mexican strain has only 3 to 8 percent. Experts consider Mexican weed to be of a lower quality because it is grown outdoors in bulk and not cured the way it is in the states. According to a representative from the DEA operatives are also buying high-potency American weed and smuggling it back to Mexico. That was not an expected development, but it makes sense. If you are a dispensary owner or medical marijuana card holder, it is important to know your rights. Our Orange County medical marijuana attorneys are dedicated to raising awareness to protect your rights and keeping you abreast of changing marijuana laws.